Welcome to Books for Pleasures, the Canadian online bookstore with a difference. What makes us unique is our Focus. We believe in showcasing the work of new authors while protecting their copyrights and paying top royalties. We also believe in providing our readers with high-quality, entertaining reading material for all ages. At Books for Pleasure you will find a wide variety of literature. Some of our books are in electronic format and can be downloaded to your own personal home computer or to a hand-held, portable E-book Reader or Palm PC. Other books on our site have been published by us, or previously published or self-published by the authors themselves, and can be ordered through our website. Thank you for your visit and please stop by our bookstore and giftshop often to check for new additions. 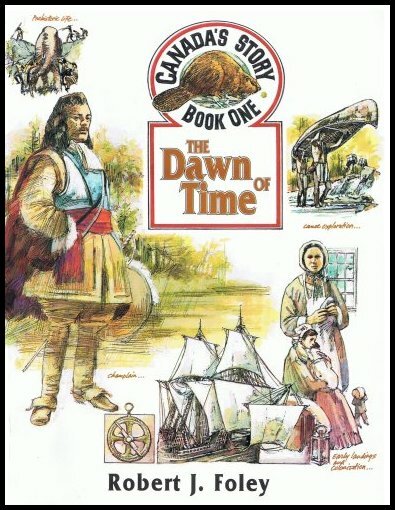 CANADA'S STORY, THE DAWN OF TIME (Book One) and THE STRUGGLE FOR A CONTINENT (Book Two) In BOOK ONE, THE DAWN OF TIME, Author, Robert J Foley, has captured the history of Canada from the dawn of time to the destruction of the Hurons in 1649. It is intended to show the contribution of all the people who have settled this land from the First Nations to the French explorers who risked everything that we might have a country today that we proudly call Canada. In BOOK TWO, THE STRUGGLE FOR A CONTINENT, with the destruction of the Hurons the balance of power shifted dramatically. The Iroquois ranged freely over the St Lawrence Valley shutting off, for a time, the life's blood of Canada, the Fur Trade. This era in Canadian history also saw the beginnings of the great struggle for control of the North American continent. France claimed everything west of the Allegheny Mountains and it was Canadians who enforced their sovereignty over the vast territory from Quebec to New Orleans. We meet the man who, more than anyone since Champlain, helped shape this country, Louis de Buade, Comte de Frontenac.